Program that detects type of your hardware in Commodore 128. 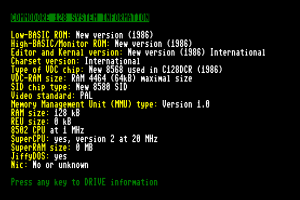 Also added recognizing CMD Hardware FD/HD/RAMLink/RAMDrive/JiffyDOS/SuperCPU/RR-Net/SD2IEC and a better detection of MMU and RAM size (SuperRAM), not works correctly in VICE. 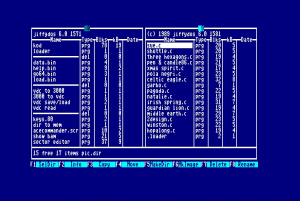 The program is optimized for 80 columns mode. Also added recognizing CMD Hardware FD/HD/RAMLink/RAMDrive/JiffyDOS/SuperCPU/RR-Net and a better detection of MMU and RAM size (SuperRAM), not works correctly in VICE. Also added recognizing CMD Hardware FD/HD/RAMLink/RAMDrive/JiffyDOS/SuperCPU and a better detection of MMU and RAM size (SuperRAM), not works correctly in VICE. Optimized for 80 columns mode. Thanks to Christian Johansson. aceCommander128 for Commodore 128 is a file manager for standard drives, also supports 64HDD,IEC-ATA,1541Ultimate SD-DCA, CMD hardware. 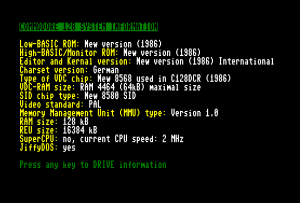 aceCommander128 Supports real-time-clock used by 64HDD or CMD hardware. Also added recognizing CMD Hardware FD/HD/RAMLink/RAMDrive/JiffyDOS/SuperCPU and a better detection of MMU and RAM size, not works correctly in VICE. Also added recognizing 64HDD drives / SuperCPU / JiffyDos and a better detection of MMU and RAM size, not works correctly in VICE.